I raised my head. The offing was barred by a black bank of clouds, and the tranquil waterway leading to the uttermost ends of the earth flowed somber under an overcast sky–seemed to lead into the heart of an immense darkness." Delta is now talking about leaving TransLink unless better transit service is provided South of the Fraser. The move comes as Surrey continues to voice its dissatisfaction with transit service here. While it’s unclear whether either cities could actually cut ties with TransLink, it’s hoped the threat of the possibility will cause the province to review the situation. Delta Mayor Lois Jackson said Tuesday the municipality gives $12 million annually in taxes to TransLink, and she believes that money could be better spent elsewhere. Delta is considering supporting a South-of-Fraser transit option. Vancouver mayors once again grapple with ways to pay for transportation projects, the wide transit disparities across the region are threatening to stand in the way of a consensus. Talks have just begun, but mayors are already divided on potential options to fund projects such as the Evergreen Line and extra buses, ranging from road tolls to gas taxes, congestion charges and vehicle levies. "There's more appetite in Vancouver to look at gas taxes and bridge tolls," said North Vancouver District Mayor Richard Walton, chairman of the mayors' council on regional transportation. "But up the valley, they feel they're terribly underserved [for transit] and distance-related levies or taxes are not palatable. "We have to see what the possibilities are on the various sources; it's not an easy task. There's going to have to be a lot of concessions made between people." The mayors agree on one thing, though: They don't want to raise property taxes for transit expansion. None of this is new. Ten years after TransLink was formed to bring more stability to the region, mayors are still struggling over how best to raise the money for transit. In the late 1990s, there was a huge public outcry against a $75-a-year levy on automobiles. 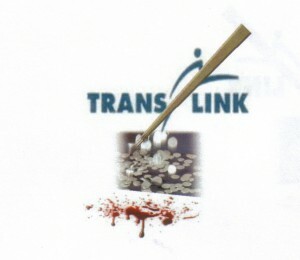 In 2006, TransLink imposed a parking-area tax to raise more revenue. "The various types of funding aren't any different from what we've been talking about over the last decade," Walton said. "Who, ultimately, wants to pay any more taxes to anyone? No one." TransLink's financial woes are coming to a head this year as the transportation authority's reserve funds dry up and it must find an additional $150 million a year just to maintain basic services. The financial situation has led Delta to consider leaving TransLink altogether. "Our community doesn't feel they're getting their fair share for the $12 million in taxes every year that goes to TransLink," Mayor Lois Jackson said. The statistics tell their own story: On the north side of the river, residents get two-and-a-half hours of transit service per person. On the south, it's half an hour, she said. Langley Township Mayor Rick Green agrees. He, along with representatives of Delta and Surrey, is pushing for the province to use the old interurban line to connect those communities south of the Fraser, noting the infrastructure would cost around $500 million compared with $2.5 billion for a SkyTrain. "Until Langley sees improvement to transit services, we're going to be hard-pressed to support much," Green said, adding 10,000 employees travel to Gloucester Industrial Park each day, yet there are no buses to take them. "If we're going to talk about a mileage issue, absolutely not. Out our way, it's not a matter of needing a vehicle; most families have two, three, four vehicles because there are no other options. Why should we be penalized?" Transportation minister Shirley Bond, who last year agreed to give TransLink and the mayors' council an extension until the end of this month to come up with its $400-million share of the Evergreen Line, could not be reached by press time. But Walton said the mayors' council is moving forward. He plans to meet with both mayors and councillors to identify the regional differences and perceptions. A long-term transit plan should be ready by April. "It's going to be more of a basket of options than coming up with one funding source," Walton said. "Every time we have an expansion to the transit system we don't want to have to go through a cathartic experience." TransLink spokesman Ken Hardie, whose staff has been researching various funding options used across North America, noted the disparities show that "depending on where you are, you will look at the world differently." Langley City Mayor Peter Fassbender said there is some consensus: Many mayors support using revenue from the carbon tax for transit because it's seen as more equitable across the province. However, for this plan to happen the province would have to approve it. Unlike Green, Fassbender isn't convinced it's such a bad idea if the Lions Gate and Ironworkers' Memorial bridges are tolled. "We need to look at all these things," he said. "We're looking also at trying to change behaviours." But he adds: "The challenge for us south of the Fraser is we probably pay a higher share, per capita, of that because we don't have the transportation options, yet the vehicle levy penalizes us. Somebody living in an apartment in downtown Vancouver with a bus outside their door … [who doesn't] need a car, they don't care about a vehicle levy." But Vancouver Coun. Geoff Meggs said tolls, such as the ones on the Golden Ears Bridge, aren't contributing to transit projects. "That's going to be a tough one for some people because the existing bridges across the Burrard Inlet are not tolled," he said. He also argues it isn't fair to say Vancouver apartment-dwellers aren't feeling the pinch. "Vancouver residents contribute every way to transit investment," he said, noting parking sales on downtown garages stuff the transit coffers with millions of dollars every year, while half of transit users are Vancouver residents who also pay taxes. "It's not just Vancouver residents who are riding transit in Vancouver, it's virtually every resident; as long as everyone is using the roads."